Gretchen Carlson helped pave the way for the #MeToo movement, and now she is looking to make an impact on Miss America by giving young women the opportunity to show there’s more than meets the eye. Perhaps no one is more responsible for the current #MeToo movement than Gretchen Carlson. In 2016, the former Fox News host filed a sexual harassment complaint against the network’s chairman and CEO, the late Roger Ailes, who was ousted from his position just weeks later. The lawsuit was settled for $20 million, but that is not where Carlson’s story ends, but merely a new chapter begins. Since then, she has become an outspoken advocate for women’s rights and has authored her second best-selling book, Be Fierce: Stop Harassment and Take Your Power Back. And now she is looking to affect change with something near and dear to her—the Miss America Organization. Carlson, who won the competition in 1989, has become the first former crown holder to become chair of the organization. The move came after Miss America’s former leadership resigned upon the revelation that they had been making disparaging remarks about former contestants’ looks and sexual activity. Carlson and her fellow board of directors’ first order of business was a bold, if not somewhat controversial, statement: eliminating the swimsuit competition. The move has been met with mixed reviews, including some with direct involvement who feel the move to distance Miss America from being a pageant has gone a step too far. Nevertheless, Carlson and the new team in place are pressing onward as they look at Sept. 9, when the competition once again takes center stage at Boardwalk Hall in Atlantic City. 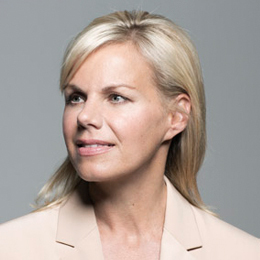 The day before, the Gretchen Carlson Leadership Initiative, a yearlong program designed to uplift women by offering civic leadership and advocacy training, will host a special free workshop in town on Stockton University’s campus. Carlson took some time to speak with us about the changes, her visions for Miss America’s future and how she feels about her role in the #MeToo movement, including what it will be like for her to see Nicole Kidman portray her on the silver screen. First of all, it was a not a role I ever expected to have. The last two years have been incredibly busy since I sued Fox News. I became an advocate. … I’ve been pushing legislation on Capitol Hill, I am an active speaker across the country and I started my Gift of Courage Fund. And I went back to TV. It wasn’t on my radar screen. But there was a call to duty among former Miss Americas who felt I would be the right person to steer it in a new direction. I was hesitant, I knew it would be a huge task. Trying to wrap your arms around an organization in a couple of months is a huge challenge no matter who you are. I decided because of the benefits I received from participating in Miss America, and I am aware of the many thousands of women it has helped; it was a call of duty for me to give back. It’s a huge job, a volunteer position and I am probably putting in 70 hours a week, maybe more. We are doing it for the candidates and doing it for the women who will follow this wonderful group as we move toward our 100th anniversary. Those are the really heartfelt reasons. I can tell you, it’s the toughest job I have had in my life, and I’ve had a lot of jobs. Our board unanimously made the decision, not Gretchen Carlson. When you look back, Miss America has always been a progressive organization. In 1921, when this started, women were on the Boardwalk in swimsuits—women were not in swimsuits in public in 1921. That was renegade. The idea in 1945, offeringwomen scholarships, was incredibly progressive. The board decided to eliminate swimsuits and came full circle to an organization that has always been progressive. And it’s really important to point out, when I was in Miss America30 years ago women were using Miss America as a platform or a launching pad to do other things in their life. We really felt being in charge that we had to first and foremost make Miss America relevant again. We had to make it financially sustainable and we wanted to make it more inclusive. Thirty years ago it was 85,000 [women competing at local levels around the country in hopes to make it to Miss America], now we are down to 4,000. Since we made this announcement, we have been incredibly heartened to have heard from a dozen Fortune 500 companies that are now interested in aligning with us. We’ve seen a trend, and perhaps because of the #MeToo movement, where companies also want to have a purpose and showcase what their social message is. [Miss America] should be all inclusive for all women who want to show their goals in life, their achievements. ... We want to make it accessible to all women, not just all women who look fantastic in a bikini and high heels. Not to say we don’t honor beauty, we do. But in 2018, the organization didn’t believe it was relevant anymore to wear bikinis and high heels and hand out scholarships. We wanted to be relevant on how we honor women in society right now. [There has been an] outpouring of women who have reached out and said,‘Thank you for letting me know I can now be part of this program because I didn’t think I could.’ It’s for the next generation, they are embracing the changes. Miss America 2.0 is about getting to know the storylines of who these young women are. We will be immediately sitting down with the new winner and aligning them with groups and organizations they want to work with during their year to make a difference. You will really come to know what Miss America does. This is how she is going to use the scholarship to further her education, how she’s going to be a role model, an inspiration for other young women. It’s really about celebrating who these women are on the inside. There’s so much tradition in Atlantic City. … Coming back has been incredibly personal for me. This is where we started. It’s rich in history. This is where we want to be. Our first major goal was to reach out to the people in Atlantic City and let them know we are here, we are open and want to have dialogue with you. One of the other important things, we just didn’t want to come for the two-week period, we wanted to incorporate Miss America into Atlantic City throughout the year. We created ancillary programs with the citizens to have a partnership during the year. And we spearheaded a scholarship for the very first time to award two bright, young women who graduated from Atlantic City High School. Our mission won’t just be getting scholarships to our candidates, but as well for women who don’t want to get up on stage. We felt it was very important to develop a deeper relationship. Every day for me remains surreal. I never could have predicted where any of this would have turned out. When I jumped off the cliff by myself, I didn’t know what was going to happen the next minute. Paramount concern for me was two people in my life, my kids. I learned soon after I did the right thing for my children, they received the same fight of courage and I’ve seen it play out in their lives. If it was just for them, that would have been enough. But thousands of other women know their voice matters. It happened incredibly quickly. When you look at cultural change in our country, it has never happened fast. To see what has come so far, for women and men to speak up, in two years it is incredible. I’m grateful for whatever role I played. I would have never guessed that! And not only because she is 6-foot and I am 5-3.